Weather - -5c Start and remaining cloudy most of the day. No wind at all. Following another week of almost constant rain and another bitterly cold start at minus 5c the river is again in a bit of a state as we load up for another session. We don't waste any time trying for live baits as the mooring is also looking like Chocolate soup. As we head towards the city, a shroud of mist is hugging the river making it feel even colder and quite ghostly. Neil pilots the boat as i set up the rods for both live and dead baits. I'm hoping to catch a few lives when we reach our first swim at the playhouse. It never seems to take as long when your doing stuff on the way and we arrive at the swim just after half Seven. 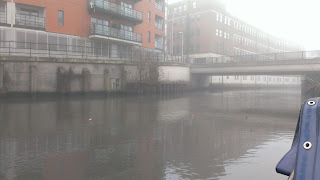 The mist is not as thick in the city and the river is a tinge of Grey instead of Brown here too. 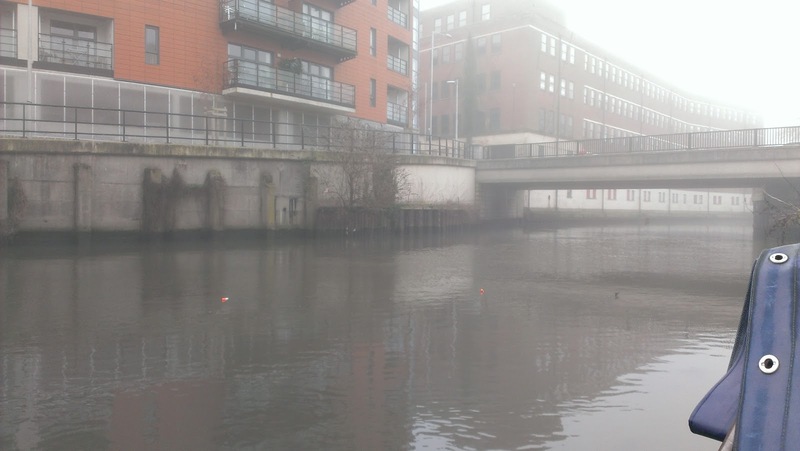 We are only half a mile downstream from New Mills Yard which is where the tidal river finishes or starts depending on which way you come from. We soon have just one dead bait out each, i also set up and have a go with a small bomb rod for the live baits. The flow is still much more than we like here and we have to increase the size of our ledger weights to keep them holding in the flow. 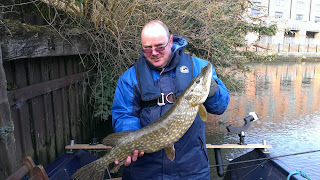 At just about 9am i get a few plucks at my Smelt followed by a classic sliding under. I wait until the braid tightens then lean into it. The rod goes over nicely and im into what feels like a decent fish. A few seconds later its off. I reel in and check the bait, its heavily marked but everything else looks fine. I get a new bait back out and carry on with the bomb rod which up to now has produced nothing. During the next half hour our baits remain untouched but Twice in the space of Ten mins we see a largish fish swirl on the top on the opposite bank. Its on the outside of the bend here and it looks like the flow is a little slower so we decide to move over there and try fishing in the slower part of the river. Another hours drifts by with still no improvement so a proper move is called for and we head back downstream to the Turning Basin at around Noon. This is another swim where we can moor up out of the main flow and thus keep our baits clean from rubbish etc. I give Neil the back of the boat swim, This is the bush that is always worth a fish or Two even when it fishes hard. His bait is only out for about Fifteen mins when it shoots under and he`s in. Apart from another missed run also from under the bush, that's the final action of the day. The mist has finally cleared as we head back at almost Three oclock. Another frustrating day as i felt despite the river being a little off colour, we should have had a few more runs at least. The livebait rod never produced a bite all the times we tried it.